It might be a sign that spring is here – but it didn’t bring a lot of valuable information to the market. 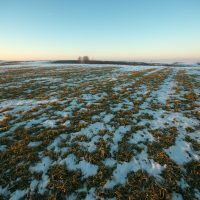 Wisconsin’s first crop progress report for 2019 was issued on Monday and gave a confirmation of what many already knew. There’s been no field work! Most reporters said alfalfa and winter wheat had not broken dormancy. Winter wheat condition is based on those areas where the crop has emerged. Hay conditions will begin the first Monday in May. Statewide alfalfa winterkill numbers will be published in May. Topsoil moisture supplies were rated 0 percent very short, 0 percent short, 52 percent adequate and 48 percent surplus. Subsoil moisture supplies were rated 0 percent very short, 0 percent short, 52 percent adequate and 48 percent surplus. As of March 31, spring tillage was 0 percent complete statewide, compared to 1 percent last year. Statewide, 32 percent of the winter wheat crop was reported in good to excellent condition. Warm daytime temperatures and below-freezing nights had maple sap flowing this week. Reporters commented that the sap run started later than usual this season. Reports were mixed about the quality and volume of this year’s run.